Images of Toronto in its colonial infancy, taken more than 150 years ago. For the earliest known photographs of Toronto, we have a sales pitch to thank. Following the union of Upper and Lower Canada as the United Province of Canada in 1841, Canada’s new parliament drifted from city to city. Kingston, Montreal, Quebec City, and Toronto all hosted the wandering colonial government. On April 14, 1856, the legislature voted 64 to 54 in favour of ending its recent practice of alternating parliamentary sessions between Toronto and Quebec City. The job of determining a permanent capital was handed to Queen Victoria, who examined presentations from those two cities, along with presentations on behalf of Kingston, Montreal, and Ottawa. 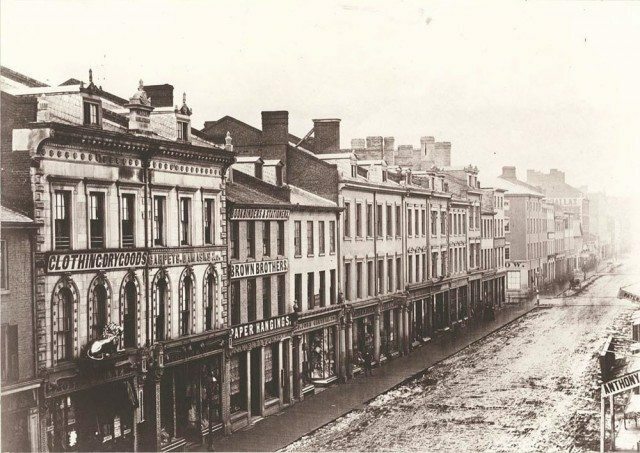 While Toronto’s pitch failed to sway the queen (she named Ottawa the capital in 1857), it preserved a record of what the growing city looked like. The photographic and civil engineering firm of Armstrong, Beere and Hime was hired to provide a set of 25 photos for Victoria’s consideration, which were forgotten until an archivist found them by chance in 1979 while researching images of the British Columbia gold rush at the Foreign and Commonwealth Office Library in London, England. The photos were exhibited at the Market Gallery in 1984, and a set of copies were presented to the City archives as a gift for the city’s 150th birthday. Step inside our photo gallery for a glimpse of some of Toronto’s major landmarks a decade before Confederation, along with a little history of them. (Toronto: Baxter Publishing, 1961), Choosing Canada’s Capital by David B. Knight (Ottawa: Carleton University Press, 1991), the May 5, 1857 edition of the Globe, the March 22, 1984 edition of the Globe and Mail, and the April 12, 1901 and May 22, 1982 editions of the Toronto Star. A hat tip to Reddit for bringing these images to our attention.